Karva Chauth Blessings with beautiful pics. Don't miss to wish your loved ones for long and prosperous life. 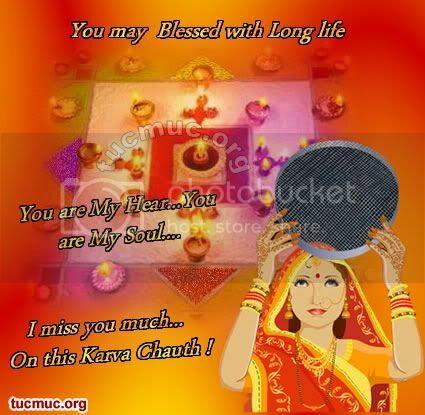 Check out Karwa chauth pics and images for this auspicious occasion. Karva Chauth is a one-day festival celebrated by Hindu women in North India in which married women fast from sunrise to moonrise for the safety and longevity of their husbands. May The Sindoor, Testify Your Prayers, For Your Husband's Long Life. The Mangal Sutra Reminds You Of, The Promises That Binds You. And The Color Of Mehndi, Prove The Depth Of Your Love. Happy Karwa Chauth!